How might we reduce single-use consumption in our everyday lives by reimagining a relationship between humans and objects? A throwaway economy has produced enormous waste, and the overuse of disposable items has aroused to one of the most serious problems in the urban environment. A lot of educated individuals are aware of the problem, but a lack of actions has aggravated it in everyday lives. How can design play an important role in this context? Nonliving Stakeholders responds to the question by reimagination of the relationship between humans and objects. Objects have been victimized by human behaviors as a cause of environmental damage. If objects are affected by humans, what if we consider them as the stakeholders? Based on this idea, I developed two different relationships (object as a service provider/object as an intelligent individual) to envision how the concept can change our everyday environments. As a Korean, born and raised in South Korea, the life in New York has given a wide range of experiences to me. Among them, one daily challenge to endure was the culture of single-use consumption and the way of waste disposal. I have gone through a lot of uncomfortable moments in various social events, seminars, and networking spaces. Many professionals and industry experts had intelligent conversations in the venue, however, they used numerous single-use items which have been relentlessly disposed of. I believe a majority of educated people are already aware of the seriousness of excessive consumption and waste. Although they discuss new ideas to resolve social and environmental problems to face, they keep ironically causing waste that impacts on the environment. Why do they still use the problematic products? How can people make better decisions? These questions have stimulated me to be able to arise my research topic. How might design help individuals’ decision making? How might we reduce single-use consumption in our everyday lives? As an industrial designer, I particularly examined the relationships between humans and man-made objects. Goods have been created for human needs and consumption, but eventually, they have become the direct cause of environmental damage. On the other hand, as a transdisciplinary designer, I have attempted to draw a prevalent waste issue from diverse angles. We are sure that there was a milkman who was delivering and collecting milk bottles to reuse. Through the research of the history of throwaway economy and waste problems in the US, I found that corporations have led a throwaway economy since the 1960s. The economy has accelerated the use of single-use package and containers to offer convenience to consumers. Disposable items were created for safety and hygiene, but they have been overused to satisfy the corporations, particularly food manufacturers. Disposable items allowed them to reduce the retail price of their products, but its environmental cost is now uncountable. Many environmentalists have introduced alternative products such as compostable cups or reusable shopping bags. These efforts are meaningful, but the problem is that the reusable and sustainable products are also manufactured in a large scale, and they are waiting for consumers to be sold such as other manufactured products. Because the manufacturers have shifted the responsibility of sustainable use on consumers, now we have both disposable and reusable items and both plastic and organic products on store shelves. As a result, reusable items could not substitute for disposable items. One of the most common thoughts in a throwaway economy is that many single-use items would be in a closed loop under a virtuous life cycle of a product because they are made from recyclable materials such as glass, plastics, or papers. However, the containers made of paper or plastic with food waste are indeed tough to be recycled. There is also another issue in a recycling process. A majority of people keep consuming new products and recycling them because it is believed that used goods would end up with being completely recycled after leaving their hands. However, as a matter of fact, field experts advise the best way of recycling is to reduce purchase because the amount of consumption is much more than that of recycled products. Due to a lack of public understanding and communication between front stage—making and consuming parts—and backstage—cleaning parts—in the waste stream, people’s behavior of waste disposal requires more cost to manage waste and more energy resources to deliver them. How might we broaden our understanding of the whole product lifecycle? Taking the lifecycle and further impact into account, the world might have less useful waste. Based on the insights and framework, I set the first hypothesis. Hypothesis 1. If an environmental option is provided in a consumption process, people would take a pause, and be able to pick an environmentally-favorable choice based on their knowledge. Below is two case studies that intervene two different moments of consumption process. I thought Do-it-Yourself(DIY) could be an opportunity to reduce consumption of brand-new products. Locally DIY aims to encourage people to repurpose used products by displaying them on store shelves next to new ones in the same category. They are cleaned and labeled for another usage. Based on this idea, I prototyped some repurposable products at retail stores. While investigating the meaning of waste, I have discovered that many products are dumped away in the end when an owner does not want to use them anymore. People have a tendency to dispose of their possession when “they” do not need them, or when they do not need them at “the moment”. In other words, a lot of wastes are thrown away under the “unwanted” status rather than they become useless or unusable. From this idea, I designed Reusing Bins, which is a set of new waste bins classified into several categories based upon reusability instead of material. By classifying all waste into several categories, we can reutilize some useful products from bins. Below is the prototype of Reusing Bins. I made and installed the bins in the studio at school, and examined for ten days. Then I conducted a short survey and had some direct conversations. Waste in the bin "Reusable"
Waste in the bin "Reusable if washed"
Waste in the bin "Reusable if remanufactured"
Waste in the bin "Compostable"
The two experiments intervened in two different steps of a consumption process. Based on the result, I decided to combine two case studies with a single local system. Once waste could be classified in a proper fashion through Reusing Bins, the useful items from the bin can be retouched and displaced into a local retail store like Locally DIY. In this local system, it is necessary to have a new role “waste retoucher” to collect, wash, and modify wastes. A waste retoucher could be anybody including individuals, volunteers, makers, organizations, or city agencies. They collect useful items from Reusing Bins, design the instructions, and send them to local retail stores or distributors. Both case studies in Part 1 had attracted the attention of the participants. However, there are a couple of issues to be resolved. First, the participants had different thoughts and standards on hygiene and product reusability. Due to a range of opinions, it was hard to expect the intended decisions. Second, if a used product that is already considered as trash substitutes for a brand-new one entirely, it often requires cleaning and redesigning process. However, if the cost gap between the two is small enough, it is hard to expect users to choose the used. Finally, this idea needs an additional role to operate the system. We may imagine a voluntary individual or an organization, but assigning a new role to them without compensation would be difficult to maintain the system continuously. These problems could not satisfy the hypothesis that offering an environmental option might lead to an environmentally-favorable decision. The purpose of the prior case studies was an attempt to alter the behavior of the intelligent individual in a daily life. However, it ended up with being rarely changed due to strong perception about waste that has been already formed. One of the reasons that previous case studies did not satisfy the hypothesis was to fail in changing a personal perception about waste and encouraging one to reuse it. On top of that, most people took it for granted that a used product is no more than the trash that is dirty, unusable, unpleasant and undesirable to reuse. Once they regard it as a useless waste, it is quite hard to change their behaviors. From this insight, I have investigated the human attitude towards an object. Humans have attempted to redesign objects in an eco-friendly way to sustain human activities, allowing for manufacturing, overusing, and disposing of them. I have felt that humans are too ego-centric. These objects can be thought as victims because the cause of environmental contamination has been humans at almost all times. How might we rethink the objects that are victimized by humans? To understand the relationship among humans, objects, and surroundings, I drew a stakeholder map that takes objects into account as one of our stakeholders. In a product lifecycle, a product is affected by human behavior. The life of the product depends on upon a human need, usage, and its production cost. In turn, this causes direct damage to the environment which is another stakeholder. Eventually, the damaged environment impacts on humans again as a vicious circle. The idea of considering objects as equal beings as humans goes along the lines with the Eastern Worldview. Philosophers have pointed out the weakness of the Western Worldview in dealing with climate change. In this view, humans are dominant species who have the right to utilize natural resources. In contrast to the Western, the Eastern Worldview considers humans as one of the organisms interconnected with others. It even regards nonliving things as part of the ecosystem. Once we begin considering an object as a stakeholder, we will be able to identify a deep obstacle and its consequence. In addition, this idea can be the key point to recover the relationship between humans and objects and rethink single-use consumption and waste issue in a wider point of view. Based on the concept of an object as a stakeholder, I have developed another hypothesis. Hypothesis: If people are able to consider an object as a stakeholder in the waste stream, people would change their attitudes and behaviors with objects in an environmentally favorable way. Taking a non-living stakeholder into account, the relationship between humans and objects can be broken down into three categories like below. Had humans taken a different relationship with objects from now, what change can we expect in terms of environmental interaction that affects human behaviors? I have taken advantage of a speculative design to describe an imaginary relationship for the last two. Now consider an object as a service provider. A typical product is created to serve something for humans. The physical form of the object can be also a part of service as well as a tangible tool itself. How would an object interact with a human under this scheme? I have applied the role of a human service provider to an object. 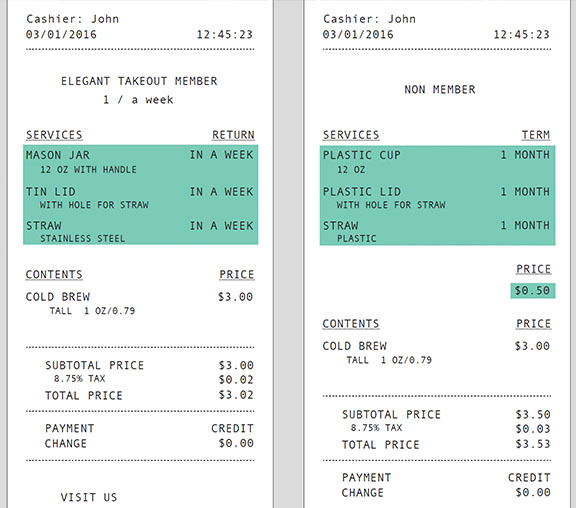 Case Study 3 is the prototype of equal relationship in the moment of purchase in a store. Service Contract shows an example of a speculative interaction that reimagines the relationship between a consumer and a product. For instance, in a food takeout scenario, you make a contract with a service provider every time when you purchase a “service”. Generally speaking, a retail store plays a vital role to be a bridge between a service provider and a consumer. A contract broker is a middleman in the store who helps to sign a service agreement. This part explains an object-leading relationship that an object leads a human behavior. What if an object has difficulty in providing service to humans? What if it wants to protest against humans? If an object may have more capability beyond providing service, what would it be? To continue the speculation process, imagine an object as an intelligent individual which expresses its emotion and even does possibly thinking and communication. Suppose disposable food containers have been abused and abandoned by humans in spite of a service contract. Even though it is not deliberate for an object to destroy the environment, constantly relentless actions of a human make it worsened. Disposable containers generate an agency together called the Container Union . The goal of the union is to protect themselves from humans and demonstrate their voices on behalf of all containers. It provides various supplies, a service, and a system with the member of the union to communicate with humans and to reduce thoughtless consumption. 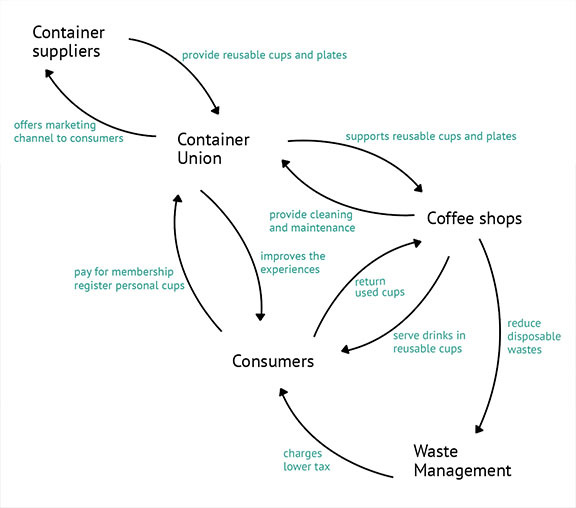 The following illustrates several examples of supplies that the union can offer for a coffee shop, a workplace for a container, to alleviate undesirable abuses. A container rest station is to be able to keep track of working hours for in-house containers per day to prevent them from overtime work. In a coffee shop, traveling of in-house container is prohibited to minimize the risk of being broken or abandoned. Consumers are required to bring their own containers to enjoy coffee outside instead. A crime-based price calculator that measures the risk cost for a container. Any potential behavior to harm a container by humans is counted as crime. If a ceramic mug has been cracked, it could be an example of crime. Consequently a human who frequently injures a container has to pay more to use in-house containers in the future. The kit includes an epoxy ointment for immediate adhesion, a roll cast to keep the shape of containers, a piece detector to search and collect broken pieces, and a sterile box to deliver the pieces to external emergency room in a sterilized condition. Designing a new product can be no longer a solution for the ceaseless desire. One known strategy both to save resources and to satisfy consumers by providing the desired service instead of making a product. In a coffee shop, people prefer drinking coffee in a ceramic mug or a glass jar rather than in a chemically coated paper cup or a thin plastic cup for better taste and mood. However, those who get takeout cannot enjoy coffee in a preferable cup when they do not drink it at the venue. Moreover, it increases waste of containers. 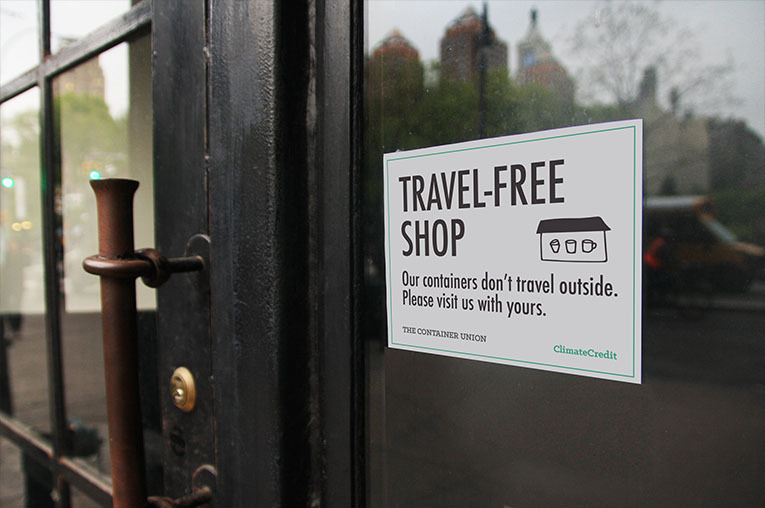 What if the Container Union can offer a service to humans to mitigate the problem? Elegant Takeout is the service operated by the Container Union to provide the subscribed members with better experience, allowing them to borrow a reusable cup available and return it to any partner store. 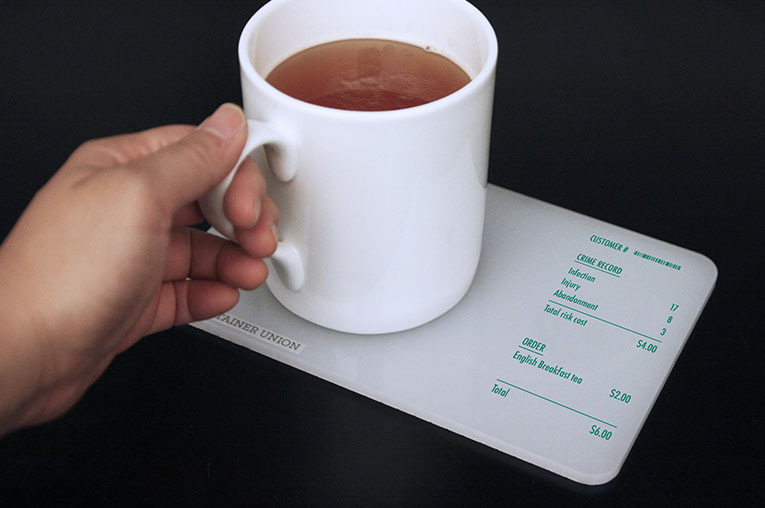 Consumers are introduced the service Elegant Takeout at a counter in a coffee shop. The members of Elegant Takeout can bring any kind of containers outside of the shop. How can Container Union change a society on a larger scale than a city? Based on the previous scenarios, I have developed an environmental credit system named Climate Credit. In the future, any interaction between humans and products could be technically traceable. With this traceability, human behavior that affects the environment reflect one’s credit. Credit could affect a variety of social activities such as employment, rental agreement, credit card application and so forth. I have discovered that most innovative IoT technologies have focused on producing business-oriented and feature-rich devices under the name of “smart”. For instance, a smart alarm clock has the functionality to speak weather and traffic information with voice recognition. The state-of-the-art battery encompasses home monitoring as well as door locking. These are good examples of human-leading relationship. However, it is hard to find the product to pursue either equal or object-leading relationship to take environmental impact into account. Designers and developers should be able to design new products in more a humane and respectful way. IoT technology is not only an opportunity to start a new business, but also a chance to have a better relationship with an object. The new relationship with an object will make it possible to move forward over Human-centered Design , which is one of the common design methodologies in design industry these days. I have no doubt that humans are an important element in the design, nevertheless, the idea of putting something in the center has its limitation to deal with climate change. Hence, we need to be conscious of other elements such as non-living objects in the ecosystem. In other words, everything has to be well-networked and well-interacted within the whole system. Based on the idea above, I propose a new design methodology, called Ecosystem-minded Design . (A better terminology might be coined for this, because the term “ecosystem” is commonly understood as the only organism even though the right definition for it has to include both organism and non-living things.) I hereby remain the suggested methodology for a further study. In a service design perspective, the concept of an object as a stakeholder can help to evolve service design in a comprehensive way. The existing service design tools have been designed to focus on humans from a diversity of angles. Meanwhile, non-human stakeholders such as the environment or tangible objects that have been often overlooked. For example, a service blueprint can be redesigned differently. A typical service blueprint has “multiple channels” under the section of “user journey” on a vertical axis. Usually, the channel represents a marketing path such as space, a product, a phone, online, or mobile. These channels show various touch points when users interact with a service. Borrowing from the new concept of Ecosystem-minded Design, those channels are actually non-living stakeholders. For example, a coffee shop and a mug have their own life journeys from DESIGN to LANDFILL. Moreover, several elements of natural environments such as air, water, or soil can be other stakeholders under this concept. In this manner, channels are stakeholders. We can identify all stakeholders but humans are affected by a service, and on what impact a user and a service can make to the stakeholders through the new style of the blueprint. At the same time, the journeys of non-living stakeholders extend a service blueprint in a horizontal axis. (Figure 36) A typical user journey ranges from the stage of AWARE to that of LEAVE, whereas this new blueprint shows the existence of non-living stakeholders before-AWARE and after-LEAVE stage alongside the user journey. This new blueprint covers from the birth to the death of stakeholders. Again, it reveals that the actual user interaction happens only in a short period, and many non-human stakeholders need to prepare for that interaction. It also states how many times the user interaction can be repeated, and how long the non-living stakeholders will remain on Earth after finishing their journeys.